Five Fun Florence Facts and Win A Trip! Florence is one of those cities you must see at least once in your lifetime and then even once you have been there, you yearn to go back again and again. We love Florence so much that we are giving away a trip to the city of art in our Florence Facebook Sweepstakes. 1. Be sure to stop by Mercato Nuovo and meet Il Porcellino. Florentines and visitors alike rub the belly of this wild boar sculpture (sculpted by Pietro Tacca in 1612) for good luck! 2. Florence was the first street in Italy to have paved streets – way back in 1339. 3. Michelangelo’s David is now at home in the Accademia Gallery but this original David made his home in the center of Piazza della Signora for 350 years. A 19th-century copy is now in the middle of the piazza. 4. Street numbering can be confusing in Florence because an old system is in place along with a new one. Shops and business used to be identified in red or with a “r” after the number and private residences are identified with black numbers. The old system also means you can have a “15r” and a “15” quite far away on the same street! 5. The Uffizi Gallery is now home to some of the world’s greatest art but it used to be an office building! 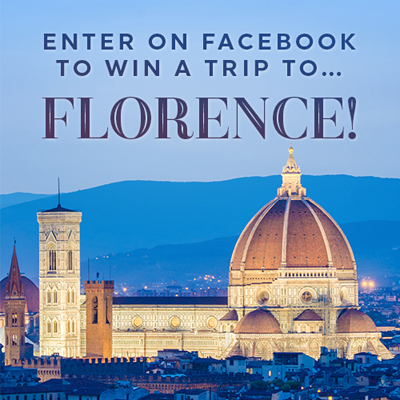 Remember to enter the Florence Facebook Sweepstakes before March 15, 2016. LOVE Florence and would love the chance to go again!! It took me 3 visits to Florence to be able to go to the Uffizi. Love love love Florence! A very interesting story, Florence is a beautiful and historic place. Very interesting. 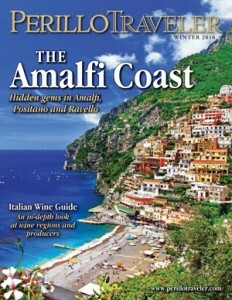 I have never been to Italy, would love to discover my roots. I have been to Florence 3 times & loved it each time. It’s easy to get around. The Ufizi Gallery is always a great place to visit. Also love the Michaelangelo Square, it has great views of the city. There is not one bad thing that you can say about Florence. From walking through the leather market, to eating lasagna in the fresh market i would love to go back to Florence and spend more time there and eat so much gelato! This would be a dream come true! It looks so lovely, fingers crossed! Been to Florence and want to go back…such a romantic, beautiful city!